Mitsubishi is taking their i-MiEv electric racecar to the 2012 Pikes Peak event. Mitsubishi is joining the electric-racecars-at-Pikes Peak bandwagon with a new racer based on the production model i-MiEv van. The funky little racer is called the i-MiEv Evo and packs three motors for a powerful sprint up the famous Coloradoan hill. The Mitsubishi i-MiEv Evo features a 35kWh battery that powers three electric motors. Two of the three motors power the rear wheels while one powers the front that, when working in conjunction, provides a total output of 322hp. The all-wheel-drive i-MiEv Evo features an aerodynamic body kit, a tube-frame chassis, and one very large rear wing. The electric racer will be piloted by Dakar Rally winner Hiroshi Masuoka while a stock 66hp also electric i-MiEv will compete in the Pikes Peak International Hillclimb as well. 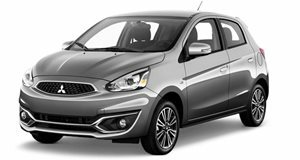 An affordable urban runabout option, but the Mitsubishi Mirage is far from being the best-in-class.